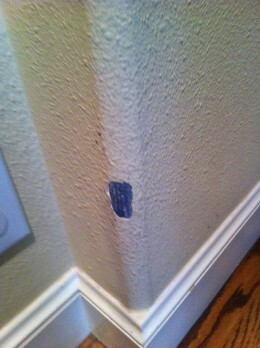 The corner of our textured wall has a big chip where the paint has come off. How do I repair it? Joint compound would work. I usually buy that in bulk, but I think you could get a small container--looking at the pattern of your wall, I think you could just smear it on with a finger and then lift off in a few places to make bumps. Then paint over and you shouldn't be able to see it. There might be something else you could use--maybe someone else will have another idea, but joint plaster will work. I do have a hub about using it. use drywall filler and a sponge. put filler over the chip , then gently push on it with a damp sponge. it might not be perfect but after you paint it , you will barely notice it. Any sort of wall filler should work. Apply it smooth using a trowel or scraper then when it has hardened slightly (5 minutes?) try to copy the texture of the existing plaster using whatever tools come to hand. If it looks rubbish then get it off before it sets and start again. matching the paint colour will make it blend in the most - more than matching the texture. There are quite a few quick fixes but most likely once it ages again it will be weakest in the same spot. Cheances are you will have to redo the whole wall. when in doubt, type it in google and you'll get a lot of how to results...for example the first one that came up when I typed in your question was: http://video.renovateyourworld.com/v/21 … tucco.htm. These videos and step-by-step instructions helped me out when I was re-grouting my shower! So much more efficient that the old days - but not as personable. I read the previous answers and just want to add my two cents. If it is stucco, be sure NOT to sand the missing patch before adding your compound. This edges will allow for a greater bond to form and also help keep the compound in place. It's hard to see in the photo, but I think that's metal corner bead underneath. It's not stucco because stucco is used outside; it's drywall mud. You've probably already fixed this being a 4 month old post, and I would assume it got chipped by moving furniture from the height of it. If you have not fixed it, I would remove all surrounding mud that's cracked. You have a couple of choices. 1. Get a can of the texture suggested in the other answers, practice on some cardboard, then spray it on your corner, let dry and repaint. 2. Get some drywall mud and a wet sponge. Scoop up the mud (you should mix it up with a drill mixer, or a stick) with the sponge and rub into the hole. Let it get tacky, not dry, then scoop up some more mud onto the sponge and dab it on trying to match the texture, let dry and paint. Don't worry, you're not going to mess it up worse. If it looks too bad, just scrape it off and start over. To make cleanup easier lay a drop cloth down over your hardwood floor and the base board. You don't have to tape it to the wall, just cover up the top of the base board and the caulk. If you don't have any of the same color of paint left you can take a chip from the hole down to Lowes, Home Depo, or whatever and their paint department will be able to match it.